Coffee cans are a common crafting supply. 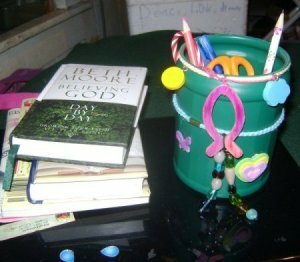 This is a guide about recycled coffee can crafts. Here are two tips for the less handy among us. 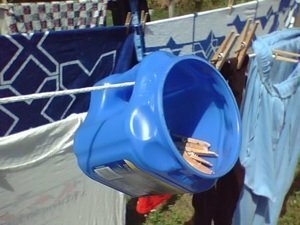 After making one cut into the handle of a popular coffee can, I ended up with a weather and bug-resistant container for my clothes-pins. One for each line, just slide it as you hang out the clothes. Thinking about it now, connecting the lid with a piece of string would keep it handier than picking it off the ground. Inspired by this, I took my trusty steak knife and carefully carved an opening in the corner of another can. And I twisted a small hole into the handle to accept the screw hook. Now the birds have another alfresco dining spot. At least now I'm not tripping over empty containers I knew could be used for something. This is a craft my 2 year old loves to make. She loves to shake up the marble in the coffee can and then take the lid off to discover her masterpiece. She also likes to watch herself shake the can in the mirror. So cute! Cut a circle of paper to fit in the bottom of a recycled coffee can. Place the paper in the coffee can, roll the marble in desired paint color, and drop the marble in the can. Add the lid to the coffee can and shake it up! Remove the lid and repeat with other colors if desired. Remove paper and allow to dry. Do several circles of paper! 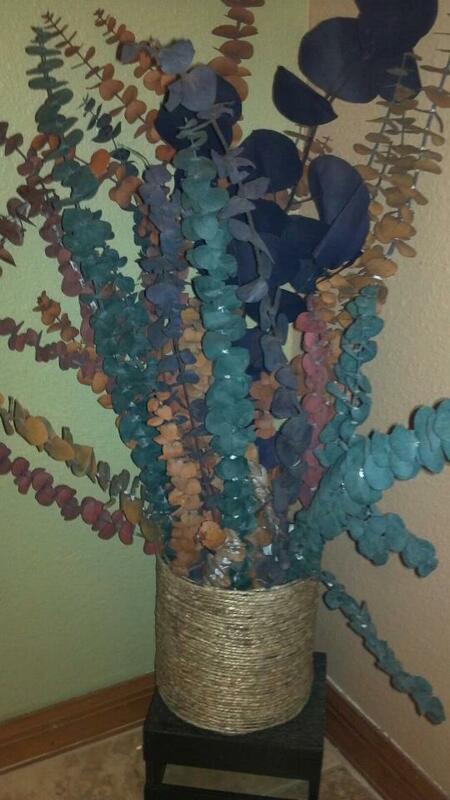 Hang individual pieces of paper to display, or attach to a string to keep them all together. This is a fun way to paint for even the youngest artists! This is a recycled empty coffee can. No need in buying the expensive flower pots and vases. Start at the bottom of the can, apply hot glue half way around. Continue until you reach the top. Being very careful that you keep the rope very tight and close so that you can't see the can at all. This is a pencil and pen holder made out of a plastic coffee container. It uses hair bands, assorted beads, and decorations. There is no glue used, but in the case of the foam heart I used a bit of duct tape. I have many 3 lb. coffee cans that I hate to throw away. Does anyone have any clever and practical uses for them? Thanks. I cover them with gift wrap and fill them with home made cookies and top with a bow. I also store cookies in the freezer in them. And at Christmas I punch out designs in them. 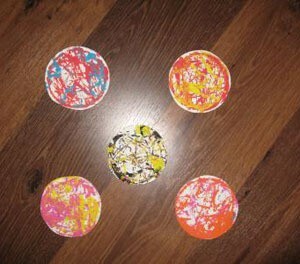 Next paint them add a candle and line the drive with them. Pretty luminaries. Dont forget the sand in the bottom! Aside from the obvious storage ideas, 3# coffee cans make great luminarias. Fill empty can with water, insert an empty plastic soda bottle, forcing it into the water with the can lid and seal the can shut. Freeze the can of water, the soda bottle will prevent the can from becoming mishapen as the ice expands. When the water is frozen, take the can out of the freezer, or off the porch if you live up North, and using a sharp nail and a hammer, punch holes in the can, creating a design of choice. The can can be spray painted before or after freezing. A design can be traced on the outside before freezing. If the water begins to melt, refreeze, so start punching from the top of the can, and work your way down. When finished, drain, and dry the can, and add sand and a candle. If it's very windy, put your candle in a glass jar before setting it in the coffee can/luminaria. These can be decorated for anything from Christmas to the 4th of July. They won't catch fire, or blow away. If you live where winter weather is bad, you probably know you should carry an energency kit in case you get stranded (munchies, water, etc). What if you can't even get out of the car to go to the bathroom? Add an empty 3-pound coffee can to your kit, with a roll of toilet paper inside. Let's hope you never have to use it, but just in case ...! My wife use to run a daycare here in the house. We use to decorate the coffee cans with paper and feathers, old buttons or whatever we had kicking around. We made little drums with the children. They loved gluing the different items on the cans. After the glue dries put the plastic cover back on the can and give the little one a plastic or wooden spoon....hours of fun. We always use ours for storing grease in but you can also punch a coin sized hole in the top for saving your loose change in throughout the year and then you have another X-mas fund at the end of the year. Cut out the bottom and use them as a fire starter in your grill. Place the can in the grill bottom, raise one side slightly using a small stick, put in crumpled up newspaper, add charcoal, put a little starter fluid on the charcoal, and light from the bottom. You will have white hot coals in just a few minutes. 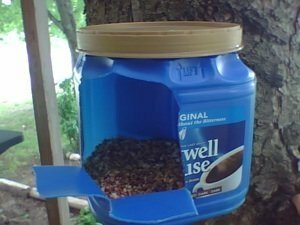 You can also use the cans for bird feeders or nesting areas. Leave the bottom in them for a feeder and punch a couple holes on the sides to string wire thru. Sprinkle some seed in the can after it is hanging. I paint the cans so they won't rust. I saw a cute idea at a baby shower held in December. The centerpieces were Santa cookie jars. Cover the coffee can with white felt and make a face using simple cutouts of felt. Glue on a white beard made out of trim. Make a Santa hat out of red felt, white trim and a white pom. Fill "Santa" with treats, cover with plastic lid and top with hat. I use all sized coffee cans to bake bread or English Muffin loaves in. You make and let rise as usual and then bake in the oven instead of using loaf pans. Kids think it's great to have round loves of bread. Especially if you are making bologna sandwiches. hahaha Perfect sized. You can also use the large ones and the smaller ones too for baking cakes too. My personal favorite is to use coffee cans for perennial transplants in the spring. I divide and give away lots of plant divisions and these cans are often the perfect size to use. They also make good planters for outdoors, and 3 can be wired together to make an interesting, larger-sized planter. You can also paint the cans and decorate them with designs if you like. Another use is to have an empty coffee can by the sink to put all your compostable waste into. Keep the lid on it until it is full. Then empty into your compost bin. Wash it out and keep using it. At work, we keep an empty coffee can by the coffee pot. The used coffee grounds go into the tin, and a fellow who is an avid gardener takes the can home when it is full. Then another empty coffee can takes its place and gets filled up again. Coffee cans are the perfect containers for mailing cookies to friends and families. Decorate the can with fabric or wrapping paper, add some ribbon around it, then pack the cookies in! Box it up and mail it - it holds the cookies well, so they don't get broken. Put vegetables in the bottom... potatoes, cabbage, carrots. On top of that put brats or some other sausage of your choice. Cover with tin foil and put on the grill. The juices from the sausages will drip down and flavor the vegetables. If you have dogs you can use them as a dog food scooper. Or a plant holder for outside, just decorate. Or,hair tie's if you have daughters or for yourself. 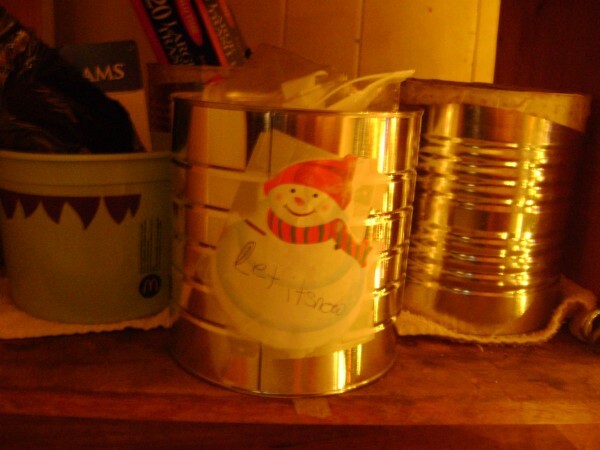 Are you sure it is safe to put food in coffee tin cans for a long period of time? Isn't there something on the inside of coffee cans that is unhealthy? let the kids build with them or maybe you could build a desk, a table, a fire pit, a pyramid to plant in! Looking for good coffee cans in the pound (+ -) size. I use them to bake pumpkin bread and they do eventually rust. Would like to find several. Cover a smaller size one with a used licence plate bent in 1/2 for a roof of a bird house. Secure it with twine thru the screw holes or other - like wire. Secure to a post near a window so you can enjoy it. I take 3 large cans and make toilet tissue holder in bathroom. It will hold 4 rolls of paper. Cut bottom out of two of them and glue all 3 of them on top of each other. Cover with fabric or towel of your color choice. I use super glue to do this. Take one tin lid and cover with washcloth. Take rubber band and gather excess. Have fun. Coffee can with decorative snowman. I love walking by and seeing this cheerful snowman smile at me! It's in my dining room on a little rolling cabinet my dad made many years ago.